Barnacles Dolphin Centre offers its visitors a rare opportunity to interact with wild Australian Humpback dolphins. Snapper Creek - Tin Can Bay is home to the Australian Humpback Dolphin. We have a resident pod of 9 Humbacks led by the Alpha Male, Mystique - the rest of his pod consists of Patch, Ella, Squirt, Harmony, Aussie, Valentine, Chompy and White Fin. The Humpback is a river & esturine dolphin requiring 18-20 mtrs of water to fish and shallow tidal creek areas where you see them basking in the sun. Their diet consists of squid, fish & crustaceans. The dolphin feeding is regulated and closely monitored by the Queensland Government with a group of volunteers on site to ensure it is an enjoyable experience for both humans and dolphins. The Dolphin Centre opens at 7.00am with viewing time between 7.00 - 8.00am. There is only one feeding session per day commencing at 8.00am. On arrival visitors are welcome to join the volunteers in the water and get to know these beautiful mammals with a small group of people in the water at any one time. Fish for the feeding is available on site. We have an entry fee and a feeding fee, and as a volunteer group we request $5.00 per person entry fee plus $5.00 to cover the cost of each fish purchased and our other costs. Dolphin feeding does mean getting wet, at least up to your knees...so come prepared! Once the dolphins are fed they generally return straight to the wild to get on with their day so be sure to be there before 8.00am to give yourself the best chance of enjoying this wonderful experience. Of course, these animals are wild so we cannot guarantee their arrival time or even that there will be dolphins on a given day. However, patience is often rewarded when they are late so order some refreshments from the cafe, sit back, relax and enjoy the scenery. It is rare for no dolphins to visit but as with all wildlife experiences it can happen. Most of all enjoy yourselves and dont forget to tell your friends and family about our beautiful dolphins and the spectacular Cooloola region. Watching the dolphins in Tin Can Bay. Read more about the dolphins here. Situated at Norman Point overlooking Snapper Creek, Barnacles Cafe provides a delightful setting for you to enjoy cafe style meals and refreshments while you are here to visit the dolphins or just taking in the beautiful scenery. Barnacles Cafe is open from 7am to 3pm every day. 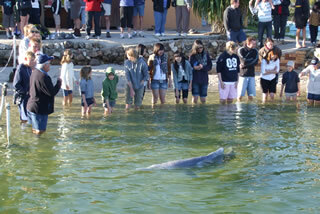 The cost to feed the dolphins includes a $5.00 per person entry fee plus $5.00 for each fish.